Three petitions filed challenging the appointment of incumbent Chief Justice Mohan Peiris was dismissed by a five Judge Bench of the Supreme Court yesterday. Two motions were set aside on the grounds of been undated and sans an affidavit. Intervening petitions filed by Bandula Wellala and Nelson Perera will be supported on July 25. The Bench comprised of Justice S. Marsoof, Justice Sathya Hettige Justice H.E.Wanasundera, Justice Chandra Ekanayake and Justice Rohini Marasinghe. The petitioners are Mahinda Jayasuriya, Athula Chandragupta Thenuwara and Janaka Adikari. 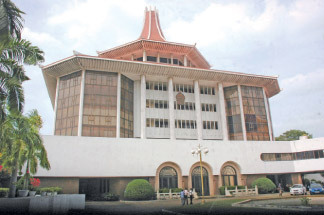 Deputy Solicitor General Shamindra Fernando objecting to granting leave for the petitions contended that the petitions were of public interest. But not of infringement of rights. When the Attorney's at Law appearing for the petitioners filed motions to withdraw the petitions the DSG objected to the move contending that the applications were of public interests. "We ( AG' s Department) did not say' no locus' to matters relating to public interest.On the contrary, wanted the law to deliver judgment, he asserted. PC M.A. Sumanthiran appearing for an intervening petitioner submitted that the world judiciary including the Chief Justice of Nigeria had not affirmed the dismissing the former CJ from holding post by way of a Standing Order which is a rule to administer Parliamentary activities and not law.